Rabbi Kosher Kush and Vanilla Kush brought to us directly from Stone Salmon Farms. YUM YUM Come try it for yourself. Concentrate….Concentrate….Concentrate! Shatter, Live Resin, Rosin, Oils, Winterized oil, wax! It’s important to know what you’re consuming. And it’s even more important to know what you aren’t consuming. We want you to know that all of our products are Alaskan Grown and tested. We strive to make sure that you can sleep easier knowing that our product is not only tested, but we also ensure safe manufacturing and facility processes. All our products are Alaskan Grown, Alaskan tested, and Alaskan APPROVED. 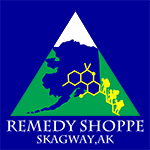 The state of Alaska requires all licensed growing facilities test all crops before selling to retail stores, so rest assured Remedy Shoppe’s weed is clean weed. If you are interested in the scientific methods used visit http://www.canntest.com/potency. CO2 Concentrates. CCell oil Kits, Disposable Vape pens, Cartridges, Stogies, PURE, Winterized Oil, Shatter, Wax, Crumble, Live Resin, Rosin all produced, tested, and packaged in Alaska. When the Green light is on we are open and have product to sell you! Currently we have bud, flower, edibles, concentrates, CO2 oils, klear, and much more…come check us out!